The creepy clowns that terrified America by lurking in bushes and along dark highways throughout the fall of 2016 have disappeared, but just because those clowns seem to have gone into hibernation doesn’t mean that the greasepainted threat is gone for good. Anyone who’s read Stephen King’s IT—or seen the 1990 TV miniseries with Tim Curry, or last year’s big-screen adaptation of King’s novel—knows that. 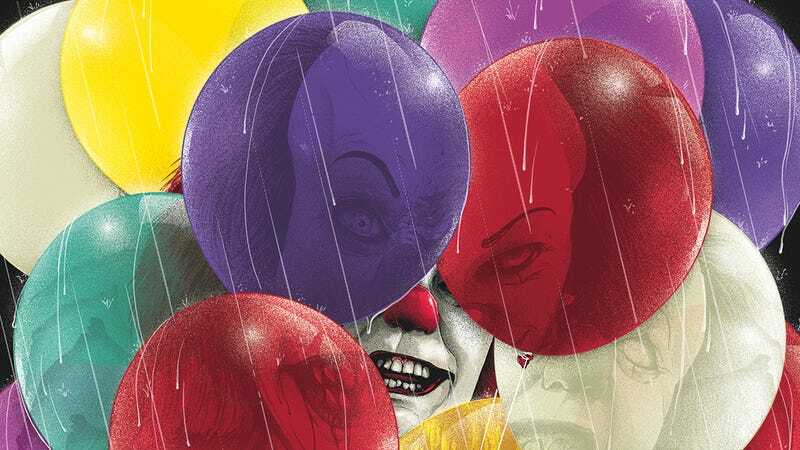 Boutique soundtrack label Waxwork Records is doing its part to keep the public alert and vigilant, with a deluxe vinyl release of the remastered soundtrack to the 1990 TV miniseries version of IT. The triple LP set (pressed onto “balloon colored” red, blue, and yellow vinyl) was created with input from King himself—as well as Warner Bros. and composer Richard Bellis—and features Bellis’ complete Emmy-winning score for the miniseries, which utilizes synth-generated music and sound effects as well as traditional orchestral cues. We’ve got an exclusive stream of “Main Title Part 1" from the IT soundtrack to set the eternally evil mood, plus a track list and images of the soundtrack if sleeve art is what floats your boat. You won’t have to wait 27 years, either: Stephen King’s IT Original Television Motion Picture Soundtrack manifests of vinyl for the first time in its entirety tomorrow, April 17. You can pre-order it now on the Waxwork Records website.